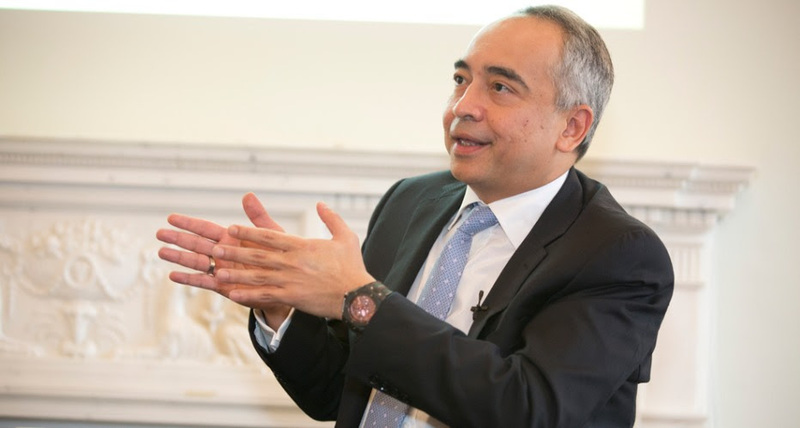 ASEAN was never intended to be that deeply integrated, the Chairman of CIMB Group Nazir Razak has told a group of business leaders at Asia House. Mr Razak explained that when the Association of Southeast Asian Nations came together 49 years ago in Bangkok it was “about the Cold War and the need to pull together in the face of the USA and Russia to preserve the way we do things.” “This concept of collaboration and economic integration is new. We would not call it ASEAN. If we had intended that, what would be called? ASEANites? I think you have to separate the rhetoric from the reality,” he said in conversation with Chief Executive of Asia House Michael Lawrence at the conference held, in partnership with KPMG, on Friday 16 September. “ASEAN has always been focused on trade and investment and the rhetoric about one vision and one community is just that: rhetoric,” he said. He said the ambitions of the 2007 ASEAN Charter’s ambitions were lofty – they included a single production base and the free movement of people – but they were not realistic. “I don’t think they really believed they could get there but they did as much as possible and there has been 99 per cent removal of tariffs,” and “lots of initiatives to bring ASEAN together,” he explained. But the Malaysian banking executive, who is the brother of Malaysia’s Prime Minister Datuk Seri Najib Tun Razak, said being based in ASEAN was “very frustrating.” “We have developed our bank based on non-tariff barriers (NTBs) coming down but they have not come down.” The bank that he is chairman of – CIMB Group – is a leading ASEAN universal bank headquartered in Kuala Lumpur and one of the world’s largest Islamic banks. He said there remained lots of NTBs that had a big value to business that were not sensitive that could be eliminated. “I think it’s best if businesses themselves spot them. One might be to allow free movement of senior banking execs across ASEAN,” he suggested. He said the was much more realistic than the 2007 ASEAN Charter. “It no longer talks about a single production base but rather about an integrated and more cohesive economy,” he explained. He said he had great hopes for ASEAN, pointing out many of the countries now had ‘strong men’ in charge citing Thailand, the Philippines and Indonesia, as examples. “Duterte has a very high approval rating and all the businesses I speak to there are quite happy with him,” he said. “Jokowi is strong and Indonesia has become much more confident in itself,” he added. “2017 marks the 50th anniversary of ASEAN with the Philippines in charge so I hope to see them give ASEAN a push,” he added. Brexit impact So what impact has Brexit had on ASEAN? “Brexit has given a push to the sceptics of ASEAN but it’s also an opportunity because Britain will have to be nice to us now and with that comes a lot of opportunities to do business together,” he said. In reference to Brexit, Mr Razak, the recipient of the, said that “Britain had always been good in a crisis”. “I think Britain has proven so again now,” he explained. But he said that whilst he felt the economic situation in the UK was OK for the time being, “if the uncertainty got prolonged, the money might come out” so he hoped to see clarity on the UK’s relations with the EU soon. As for the prospects of a UK-ASEAN FTA, once the UK exits the EU, he said it might be easier for the UK to do bilateral FTAs with member states given that the Regional Comprehensive Economic Partnership (RCEP) was still being negotiated.